Sometimes greatness comes in a very small package, wrapped in humility and gentleness. An Illinois 4-H supporter will be honored with the nation’s top 4-H award, the National 4-H Hall of Fame Award which recognizes individuals who have made a signification impact on the 4-H program and 4-H members through their contribution of time, talent, energy, and financial resources. Lila Jeanne Eichelberger will be inducted into the 2016 Hall of Fame class at a ceremony Oct. 7 in Chevy Chase, Maryland. Known as “Shorty” around the University of Illinois campus because of her 5-foot frame, Eichelberger stands as a giant among her peers for her philanthropic efforts to support 4-H and the university. Her 4-H background traces back to her mother’s volunteer 4-H leadership and continues to this day as a member emeritus of the Illinois 4-H Foundation board of directors and supporter of several 4-H endeavors. Eichelberger credits 4-H with shaping her career choices and leading her to U of I where she received two degrees and an advanced certificate. She taught home economics for 40 years. She married the late Paul Eichelberger. "Paul was the love of my life; we shared so many interests—one key one being Fighting Illini sports," Eichelberger says. "Neither of us would be the person we became if it had not been for sports, 4-H, or the University of Illinois." Eichelberger knows U of I and knows how to get things done. Today, at 88, she actively participates in each Foundation board meeting and arranges donor meetings in conjunction with the executive director and 4-H advancement officer, using her influence to encourage private donations to Illinois 4-H.
She has made financial gifts to U of I and to Illinois 4-H every year for 50 years. In total, her giving to 4-H alone exceeds $2 million. In 2000, she created an endowment to honor her late mother, a 50-year 4-H leader. Today, she continues to add value with an estate commitment to endow the Margarette E. Athey 4-H Adult Volunteer Leader Development Fund at over a quarter-million dollars. As a student, Lila Jeanne thrived at U of I and as a member of 4-H House. Today, she actively supports 4-H college scholarships for youth to learn. A permanent endowment of more than $25,000 will support 4-H Legacy of Leadership youth scholarships in perpetuity. She continues to stay involved with the 4-H House Alumni Association as a 10-plus year member of the board, volunteer property manager, and mentor to girls who strive to further their 4-H leadership skills in a cooperative living environment during college. In 1998, she played an integral role as the key liaison moving the Foundation from an independent organization to the umbrella of the U of I. “She challenges fellow board members to ask, and answer, the hard questions of fundraising,” Barnard says. Of her many accomplishments, Eichelberger served on the steering committee for the Illinois 4-H Memorial Camp “Remember CAMPaign” where she not only made her own generous commitment, but helped to raise funds to renovate the historic dining hall facility at 4-H Memorial Camp. An 11-year Mason County 4-H member, Eichelberger served as one of the first camp counselors at Western Illinois 4-H Camp. 4-H Memorial Camp will be the beneficiary of a $75,000 gift from her estate to further the arts activities at camp. A $30,000 donation funded two new cabins named to honor her late husband and mother. “The instant you meet Lila Jeanne Eichelberger your personal definition of genuineness is shattered and the bar is raised higher than you had it before,” says Curt Sinclair, 4-H Memorial Camp director. “Nothing in the mile-long list of her accomplishments is self-serving. Eichelberger is a strong supporter of Illini athletics. 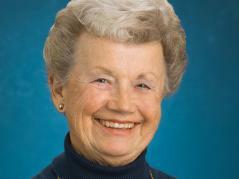 Her most recent contribution of $2 million provided funding to build Eichelberger Field, the women’s softball complex. She also supports baseball, volleyball, basketball, tennis, and actively mentors student athletes. Eichelberger served youth throughout her 40-year teaching career. She was named Illinois Home Economics Teacher of the Year in 1974 and served as Illinois Future Homemakers of America State Advisor in 1956-57. Along with an active professional career, she has been an engaged member of the community. Among her memberships are U of I Alumni Association, U of I President’s Council, Fighting Illini Scholarship Fund Tribal Council, U of I Courtsiders, Fighting Illini Dugout Club, Phi Upsilon Omicron Pi Alumni Association, Beta Mu of Delta Kappa Gamma, and Kappa Delta Pi. In addition, Eichelberger serves as an election judge, volunteer for Meals on Wheels, and active member of her church. She has a remarkable commitment to generating funds for organizations closest to her heart. She continues to devote her life to the betterment of all Illinois youth today and into the future through her sustained philanthropy. Always a visionary, Eichelberger actively spoke out in support of increasing local tax-base funding for local Extension programs. In recognition of her tireless service, she received the Illinois 4-H Foundation Friend of Illinois 4-H Award in 1999 and Hall of Fame award in 2005. "Anyone who knows me knows that I bleed Illini orange and blue and 4-H green," Eichelberger says. "It is an honor to have Paul's and my legacy live on through a gift from our estate. If we are remembered for just one thing, I hope it will be a commitment to the development of the next generation of young people." The award is sponsored by the National Association of Extension 4-H Agents, National 4-H Council, and National 4-H Headquarters. Since its inception in 2002, only 322 people have received the national recognition.